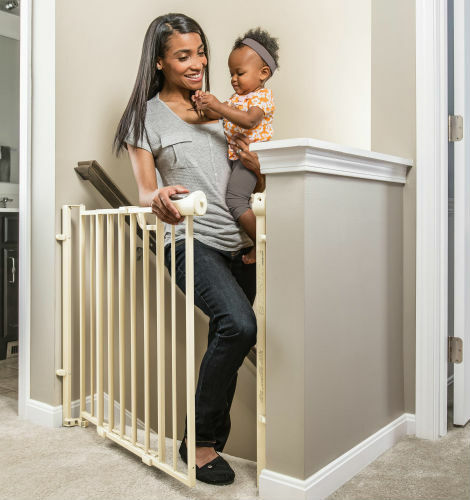 What Are The Best Baby Gates For Stairs? There’s no more important place for a quality baby gate than at the top of your stairs. 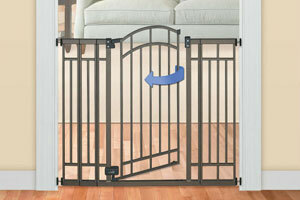 If you have a little one and a multi-story house, then finding the right baby gates for stairs is very important. We’ve put together this page comparing some of the best gates made for stairs in hopes that it makes your search a little easier. 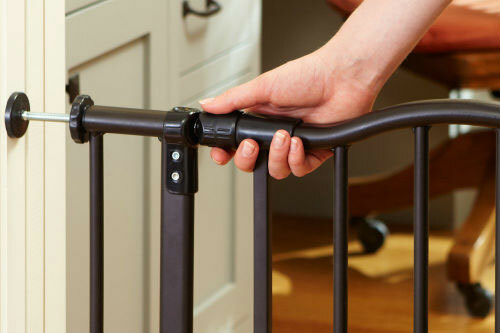 The Evenflo Easy WalkThru Baby Gate was designed especially for mounting at the top of stairs. It comes with a removable swing stop so the gate can only swing open away from the stairs when you have it mounted there, has a one hand release handle that is designed to be too difficult for children, and has a red/green lock indicator that lets you know if the lock is properly engaged or not at all times. 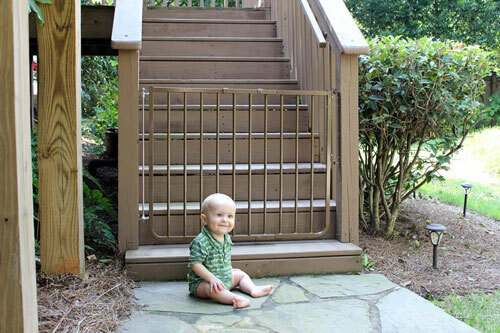 There are a few important considerations when it comes to baby gates for stairs. For one, if the gate has a door or swings open to let adults pass through more easily, you want a gate that only swings in one direction so it can never swing out over the stairs. Secondly, baby gates at the top of the stairs should pretty much always be hardware mounted, rather than just pressure mounted, to the wall. 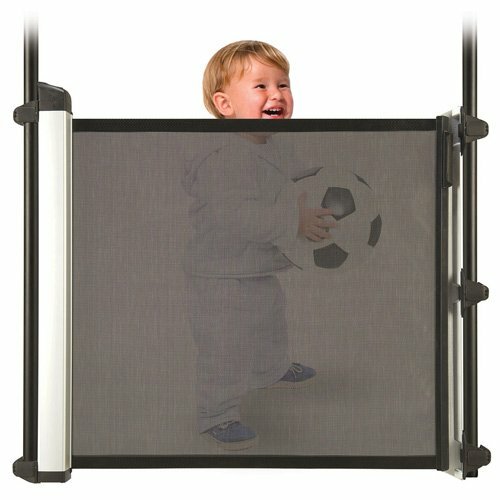 This is the most crucial area you don’t want the gate to fall over if the baby leans on it or weight is otherwise applied. 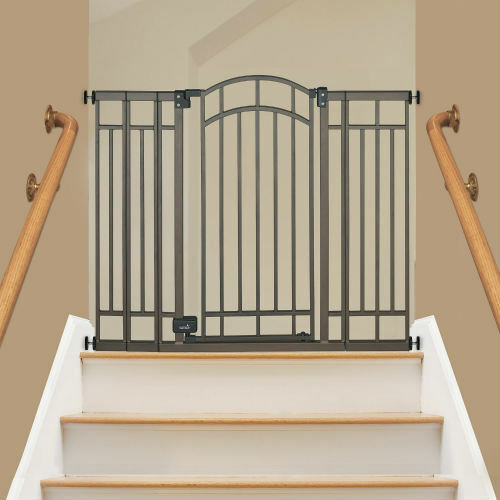 The top of the stairs is clearly the most important spot for a solid gate, so if you’re looking for top of stairs baby gates it also helps if the product has been thoroughly tested for that location and passed a certification process. The Juvenile Products Manufacturers Association provides one such certification process, and we’ve indicated below any products that have been JPMA or otherwise certified. Of course, sometimes you are shopping for a baby gate for the bottom of your stairs where you still want a quality gate but the risk is not as high. On this page we have compiled gates that both work for the bottom of stairs and gates that are specifically designed for the top of stairs. Any any gate designed for use at the top of stairs will work at the bottom as well, but not vice versa. And the amount of space you have to attach a gate at the bottom of stairs generally varies more than at the top, so some parents may need an extra-wide gate at the bottom. You can use the comparison chart below to compare the various maximum widths of the baby gates for stairs and pick the highest quality one that works for your home. Hopefully the comparison table above is helpful in quickly identifying some of the best baby gates for stairs and which ones may work well for your home. Now we’ll examine a few of our preferred gates in more detail. 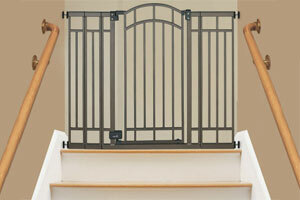 Baby gates for the top of stairs necessarily must come with certain features to fit their specific job. The Evenflo Easy Walk-Thru Top Of Stairs Gate does just that and is very specifically engineered to be a solid and easy to use top of stairs baby gate. 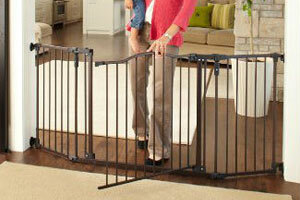 Customers comment that it is very sturdy, made from a heavy metal, and is more heavy duty than most other baby gates. It has a locking feature with an indicator color that tells you at a glance if the gate is securely locked or not. And beyond the lock, the opening mechanism is designed to be easy for an adult to do even with one hand, but impossible for a child. 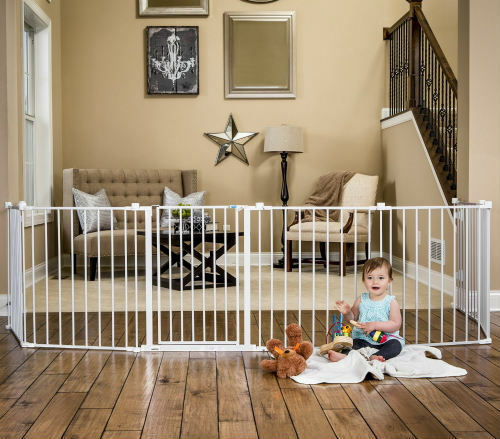 All these features combine to make one of the most trusted baby gates for the top of stairs, even among daycare operators who heavily rely on it every day. 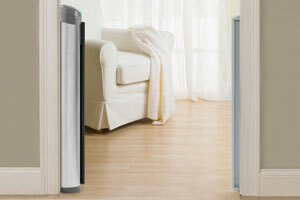 The Evenflo Easy Walk-Thru fits openings between 29 and 42 inches wide. It installs in about 15 minutes with a bracket-based hardware. While it’s a simple installation, it’s worth taking some time to tweak things, tightening screws until you are assured you have a solid gate. 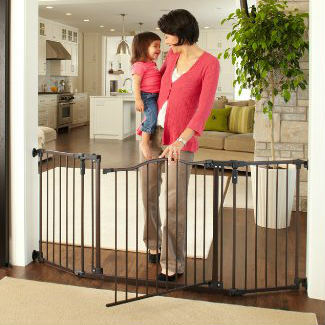 The Summer Infant Multi-Use Deco Walk-Thru Gate makes an appearance as one of the best baby gates with doors list as well. It is often used as a pressure mounted gate, but what makes this gate “multi-use” is that it is also hardware mountable for use on stairs. It comes with all the hardware necessary, which is optional for normal installations but should definitely be considered required for installations at the top of the stairs. The Summer Infant gate is one of the most stylish options, with a matte bronze finish and an arched doorway. It has a very elegant look that also comes in a light beige color. 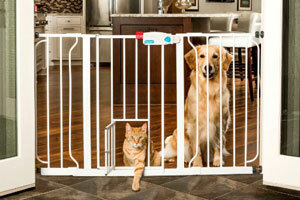 The door is definitely one of the best features of this baby gate as well. It features an automatic locking system that closes and locks the door without any additional effort after walking through. 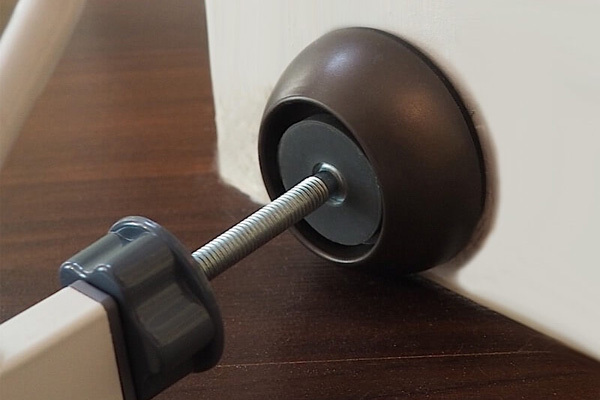 There is also an included door stop that prevents the door from opening in the direction out over the stairs. The lock itself is a latch mechanism that has received positive feedback for being easy enough to open with one hand when you get the hang of it, yet hard enough to stump young kids and even some visiting adults coming across it for the first time. This gate is versatile and fits spaces between 28 and 48 inches wide, with included extensions needed for the wider side of that range. It is also extra tall at 36″ high. Many staircases are configured such that if you are mounting hardware for your baby gate you have little choice but to screw it directly into the wooden banister. 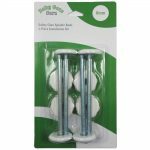 Fortunately, that’s not your only choice, as you can also get this Safety Gate Adapter Kit For Protecting Banisters from EZ-Fit to go over your banister post, allowing you to screw into the adapter instead of your finished wood. 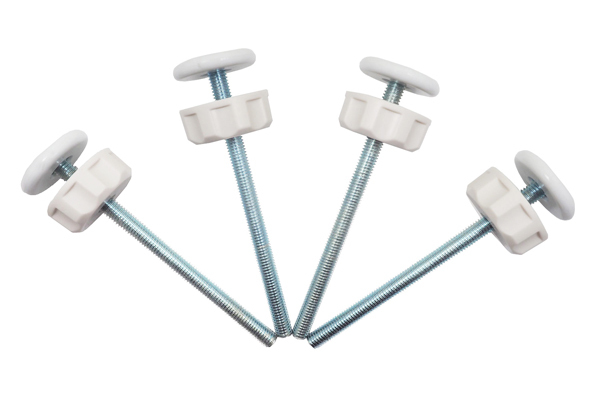 The EZ-Fit banister protector comes with one adapter, because most staircases have a wall on the other side so only one adapter is necessary. If you have an open banister on both sides though, you can just order two. The adapter is 36 inches tall, two inches wide, and made out of wood so you can screw hardware directly into it. It’s 1.1 inches deep, so will take an inch of screw securely into it without piercing through to your banister. The block of wood has slotted holes that the included velcro straps thread through before you wrap them around your banister. You can pull the straps very tight to ensure a snug fit. Of course, the adapter works best if your banister posts have squared sections where the straps attach. 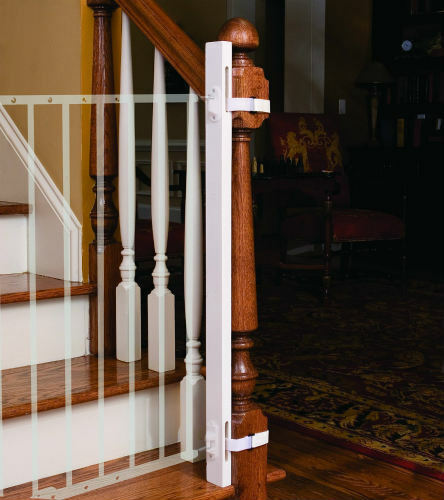 These banister protectors can also double as an adapter to even out your mounting areas if, for example, your banister is at a different level than your mounting point on the wall and needs to be straightened, or your gap is just too wide for your gate and shaving off an inch of that space would allow the gate to be secured. In any case, you save the wood on your banister and get a similarly secure attachment.